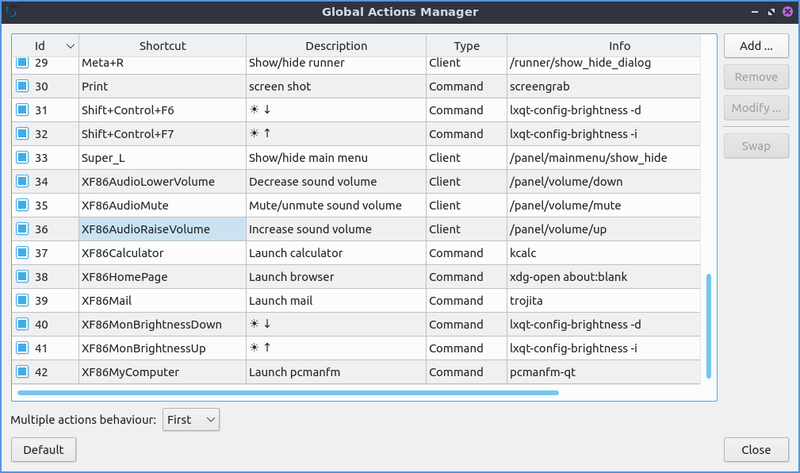 Shortcut keys is a program that manages the global hotkeys or keyboard shortcuts for Lubuntu. The keyboard shortcuts are also managed by Openbox. Refer to Appendix F for more detail. Lubuntu ships with version 0.14.1 of shortcut keys. You can Modify a current keyboard shortcut by selecting the shortcut from the keyboard table, clicking the Modify button, then clicking on the shortcut button. A countdown will begin during which you should push the keyboard shortcut combination you want. You can Remove a keyboard shortcut by selecting the shortcut from the keyboard table, and clicking the Remove button. To swap to shortcut keys you can select two shortcuts with Control+ Left Click then left click on the Swap button. You can Add a new keyboard shortcut clicking the Add button. The shortcut field will be blank, click the shortcut button to start the countdown, then press the keyboard shortcut combination you want to assign. Write a short description of what the keyboard shortcut does, for example “start drop down terminal”, or “increases screen brightness”. 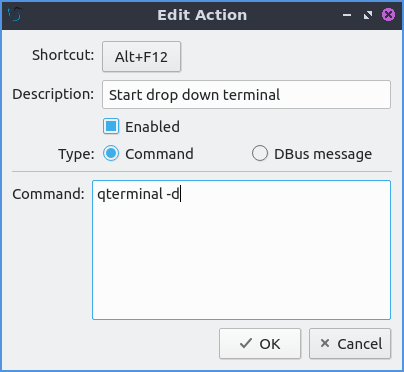 To make this execute a terminal command select the command radio button and enter the command in the Descrption field.